A bit late in posting this, but the BBC Creative Archive team were given an “Interactive Innovation” award in the British Academy Television Craft Awards a few nights back for their work on the BBC Open Earth Archive project. 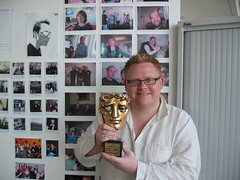 There seems to be a steady flow of people coming round to the office to see the BAFTA and have their photo taken with it (the Creative Archive guys should charge £1 a pop I think! ).